The Finnish auteur Aki Kaurismaki perfects his trademark formula of deadpan humor and arctic circle pathos in this brilliantly ironic minimalist comedy. 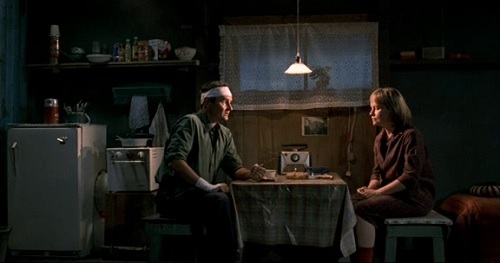 Deservedly winning several awards at 2002 Cannes festival, “The Man without a Past” scored the first ever Foreign Film Oscar nomination for Finland. Aki Kaurismaki has hit on a way to give us a humanistic and delightful film portraying grim social realism without any sentimentality . He has taken here some of the bleakest settings on earth to film the comic sweet story of an amnesiac. The movie opens with a jolt of violence followed by a jolt of absurdity. It's night, and a middle-aged man (Markku Peltola), the titular hero, listed in the credits only as “M”, wearing a solemn leather jacket, gets off a train in Helsinki and goes for a smoke on a bench. He is swiftly bashed over the head by a gang of thugs, who rob him, pummel his unconscious body with mystifying viciousness, and then leave him for dead. Shortly thereafter, he is staggering into a shopping center, apparently covered in blood. The man collapses face first into a toilet stall, a bystander phones the police and says that a man has just died. In the next shot, a doctor and a nurse hover over the still alive but critical and heavily bandaged man − and sadly watch the ECG monitor’s flat-line showing no sign of life. Grimly, they pull a sheet over him, record the time of death, and move on to other duties. 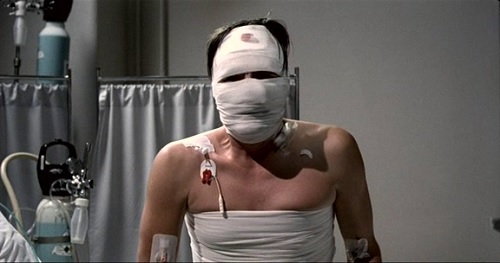 After a beat, the man under the sheet rises, pulls the tubes from his body, and staggers into the Helsinki night. The whole act seems like a comic resurrection. The man soon moves out of the shelter and looks for a place to sleep. One of the most striking figures in The Man Without a Past is the thuggish security guard who allows the amnesiac − who goes by the name of “M” − to take possession of a rubbish-strewn storage shed by the rubbish-strewn harbor in return for a not inconsiderable amount of money. “Some would pay three times the rent for a water view”, he says. The guard embodies the venality of capitalism, yet with a wink, as if he's commenting on his own role. When “M” can't pay the first month’s rent on time, the guard threatens him with a “killer” dog named “Hannibal”; then he leaves the animal behind with the warning, “Don’t try to pet him, or you’ve thrown your last dart.” Of course, Hannibal proves to be the sweetest and most loyal mutt imaginable − and the guard himself rather harmless. The man tries to earn living by planting potatoes. “M” goes for his meals to a Salvation Army camp. The Salvation Army gives him a clean set of clothes and a job. Eventually, “M” finds work at the Salvation Army post and strikes up a tentative but true relationship with the woman who runs the kitchen, Irma (Kati Outinen), who at first seems closed-down, even cold. Yet underneath, she’s as hopeful as he is. They both listen to bluesy rock − a Kaurismäki motif − on their respective cots and later watch approvingly as a group of Salvation Army workers form a rockabilly band. His new life takes a new turn when he decides to turn the Sally Army band into a passable rock-and-tango combo. 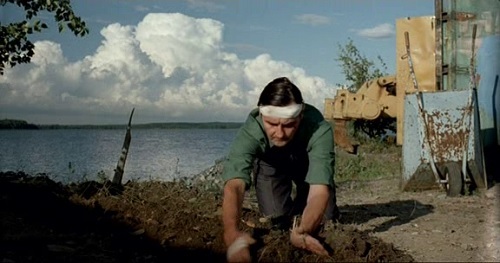 The road to a happy conclusion only briefly detours when he is involved in what must be the most no-nonsense bank heist in cinema history, a drily farcical sequence executed with Kaurismaki’s typical economy. It happens when “M” goes to open a bank account and a bank robber holds him up as well as the teller in the bank. After the robbery, the police throw him in jail for refusing to give his name and social security number. The Salvation Army attorney gets him out. Meanwhile, the police report about his arrest locates his wife. He leaves his beloved Salvation Army worker and heads north to go back home, where he finds that his wife has divorced him. Evidently, he was a very prosperous metal worker with a beautiful home. He forgives his wife and heads back to the vagrant community in Helsinki. 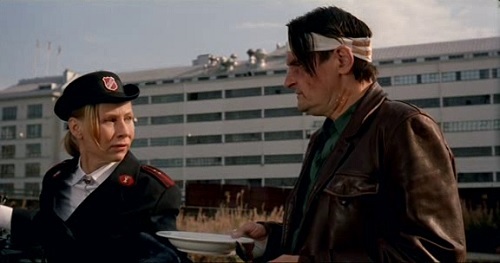 Kaurismaki’s film is anchored in anti-authoritarianism and the realities of class. His social concern is absolutely for real, with his empathy for the socially excluded (many of the extras appear to be genuine homeless people) and his critique of a callous economic system − the bank robber, we discover, does what he does for morally unimpeachable reasons. In addition, the film enquires into the problems, both social and existential, of memory loss, with M forging a new identity for himself. The characters in The Man Without a Past drift around under pale, washed-out skies, but every new scene brings an enlivening dose of rockabilly or a minute or so of lush classical music. The main actor, Markuu Peltola, with his bulky movements and overcast leathery features, is perfect for this movie with one of the most deadpan faces you’ll ever see. He is amazing to watch and Kati Outinen, as his love interest, is similarly strange and fascinating. Part of their charm is their unusual looks. This is not a romance between people who look like our normal handsome film stars. Ultimately, “The Man without a Past” is about what makes us human, about that we all are different but everyone of us can be an asset to those around us − and it needn’t necessarily be a money aid. What sets this film apart from other quirky adventures is its internal coherence (both in terms of storytelling and visual style) as well as the humanity of its characters. Keeping the comedy deadpan and playing it straight with every surreal turn of the plot, Kaurismaki has created a warm and unforgettable film.